Cabo del Sol is one of our favorites venues in Los Cabos! The property has every element needed for a perfect Mexico destination wedding: a wide ocean view, a pristine desert landscape complete with cacti, and an old-world traditional hacienda. The hacienda allows us to photograph the bride with many backdrops within a compact location. 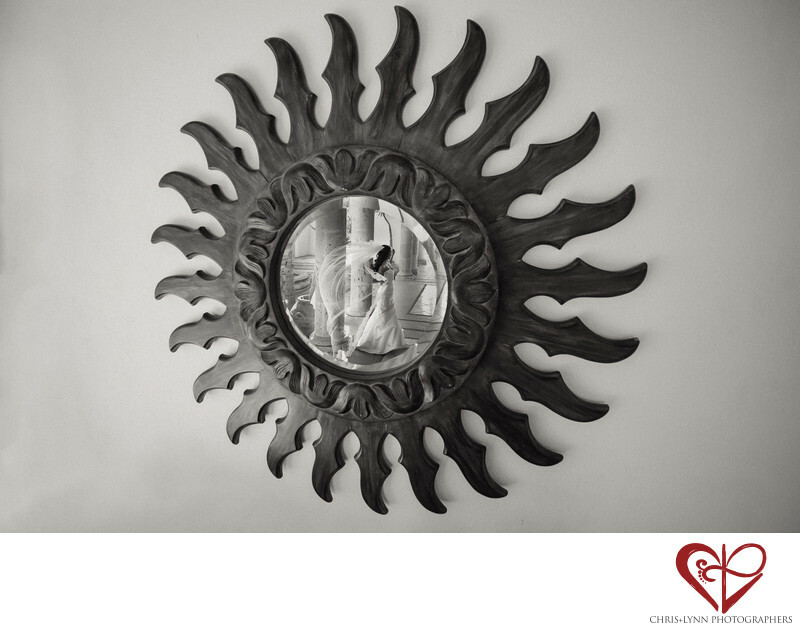 We love the rustic old chests, ornate carved wooden chairs, Mexican tiles, brick archways, and many other details in the hacienda such as this folk mirror in the shape of a stylized sun. It was perfect to capture the reflection of the bride in her beautiful Monique Lhuillier gown just before she was about to walk down the aisle, especially when a gust of wind blew her flowing veil behind her dramatically! 1/500; f/5.0; ISO 1600; 14.0 mm.